Tanner: "I think that I might kiss you to keep your lips busy from something other than insulting me." Ella: "If you think you can do it without getting lost." "Shut-up, you fool! I will not listen to your snide remarks any longer. I will stop crying as soon as you can learn to keep your mouth shut for more than a few seconds at a time." Cinder and Ella by Melissa Lemon was a big surprise! When I started reading this book I expected yet another re-telling of the classic fairytale. You know the one with evil stepmother and stepsisters, handsome prince-charming, glass slippers, pumpkin turning into a beautiful coach, ball at the palace and a girl trying to escape the life of abuse and servitude. This book, however, was nothing like the original story. 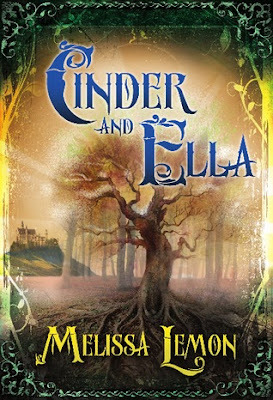 As a matter of fact, it was so different from the classic Cinderella fairytale that if not for the title, I never would have connected these two stories. Cinder and Ella, together with their parents and two sisters, lived in a small cottage on the side of a steep mountain. For a time, the family lived a happy and peaceful life. They all loved and respected each other. The sisters grew in joy and their days were filled with happiness. Their lives were absolutely perfect, and they never foresaw the dark days ahead of them. One night Prince Monticello came knocking on their door. He didn’t come in search of a bride. Nor did he want to invite the ladies to a ball. What he wanted was to gain supporters of his treasonous intentions. He spoke of the injustice and lunacy of the king. Most of his words, though, were pure deception. Unfortunately, both Weston and Adela of Willow Top were trusting people. They believed in the prince’s good intentions and they fell for his lies. After the prince’s visit the family of Willow Top started to fall apart. The father, bewitched by a dark, invisible spell, eventually started to lose his mind. The prince’s words poisoned his thoughts and he became bitter and gloom. He started to neglect both his blacksmith business and his family, until one day he disappeared without a trace. The sisters started to mistreat each other and often fought over silly things. Devastated by the disappearance of her husband, the mother was no longer capable of taking care of her daughters. She became disconnected from the reality and spent her days at the spinning wheel. Cinder, the kindest of all daughters, ends up having to care for her whole family. Treated more like a servant than a family member, she now has to look after her sisters, Katrina and Beatrice. Just like Cinderella in the original fairytale, Cinder is in charge of all the chores in and around the house, working from early mornings to late evenings. The tough family situation is not everything she will have to deal with, though. Both Cinder and her sister, Ella, will have to face a huge danger. The evil prince is out there to get them, and he is charming and deceitful. Will the sisters be able to recognize the danger in time? Or will the evil triumph this time? I really enjoyed reading this novel. The writing is simplistic, yet very captivating. The book is slightly more than 200 pages, which makes it a quick read. The plot is fast moving and you don’t really get those slower moments, when you feel like you can cast the book aside for a while. It’s the kind of book you can easily devour in one sitting. I found myself really engrossed in the storyline and wanting to find out what will happen next and how the whole thing will end. My only complaint about this book would be the nonsensical or absent motives for many characters’ actions. The prince is evil, dark and devious, but we never really learn what caused him to be like that. I mean, he comes from a good, loving family. The king and queen seem to be perfectly reasonable people who care for their son. There was no wicked witch to cast a spell on him and he didn’t fall on his head when he was a child. There just doesn’t seem to be any logical explanation for his evilness. Same goes for the father and the king and queen. I just didn’t understand the motives behind their decisions. I do, however, believe that this is just how the traditional folktales are and that’s the beauty of the genre. It’s meant to be simple. And you’re not supposed to question the motives. We’re talking about a story, which is written in a way that preserves the tone of a classic old fairy tale. The guy is evil because he likes it this way. Period. I highly recommend this book for a beach read. It might be slightly darker than the original, but it’s not heavy or depressing at all. If you’re looking for a quick read to pass the time, Cinder and Ella may just be the novel for you. Here's the complete tour schedule, some blogs -- like Bookish -- are hosting giveaways, so make sure to visit them all! :) Happy hopping! Sounds good, this book is on my wishlist! Thanks for the review and giveaway! I'm always interested in retellings, especially if they have unique takes on the story (I just finished reading Zoe Marriott's retelling of Cinderella, Shadows on the Moon :) ). So I've always been a big Cinderella fan and all variations. Can't wait to read this one. Thank you for your review. It's very in-depth! I'm really looking forward to reading this book because I love fairytales! Yours is the third review I've read for this book and it looks like a good summer read. Thanks for hosting the contest. Have already added the book to my wish list! I have already added this book to my TBR list! Another Cinderella story bring it on! Evie, this book looks like so much fun! June was an absolutely crazy month for me and I really need some light, fun reading! Thanks for hosting a giveaway! Thank you for the review and giveaway! I just love fairy tale re-tellings! This sounds like a really cute read =) I love the title for some reason -- it's just fun to say aloud. Thanks for the review! Cinder and Ella sounds like a fantastic story and I'm looking forward to reading it. The title draws me in- very enthralling! I love fairy tale retellings, and this one seems interesting! That's awesome that the author split the Cinderella name into 2 characters. That's a unique twist! I am just now currently reading this. It has been amazing so far! This sounds like a very sweet read. I think I will be picking this up for a present for a FRIENDS DAUGHTER. Thanks for the review. I have heard lots of good things about this book. Sweet and a quick read. I just bought this for my sister :) I'm glad that you liked it, now I know I chose a winner! From everything that I've heard about this book, I very much want to read this now! great review! I'm not really a fan of the cover, but I love the way this story itself sounds. I love fairy tale retellings, but I love how this is even more than just a spin on a classic tale. Cinder and Ella sounds unique and enchanting, and even a little dark. Definitely my kind of book. Thanks for the review! Wow!! The story sounds great. I have to read this book. And your review is great too, made me can't wait to read this book by myself. A deceitful prince? Hemmm....I'm so curious with the ending. I want to read Cinder and Ella. A retelling that is completely different? But still a retelling? Yep, I want to read it. Even more so after your review. I have actually seen this one before, but I passed it up because I (wrongly) assumed that it wouldn't be anything new. Shows me not to judge, huh? Another re-telling of a fairytale. Cinderella is one of my favorite childhood fairytales!Can't wait to read this! Thanks for the review!